The limelight rarely shines on some of L.A.’s best. Four chefs give us a sample of their roots. Victor and Elaine Phan thought their mother’s recipe for beef pho was too good to keep to themselves. 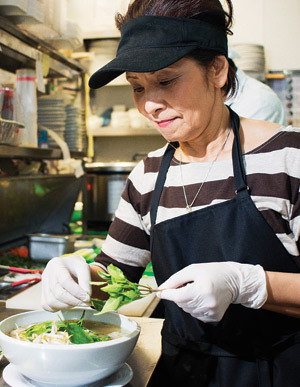 In May they opened Nong Lá Vietnamese Cafe in Sawtelle’s Little Osaka corridor, a strip better known for its Japanese ramen. 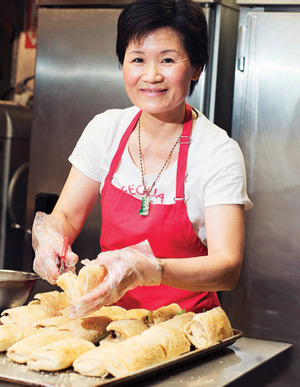 Khanh Phan’s home-style Vietnamese cooking has drawn raves from Saigon natives looking for the flavors of home: cha gio egg rolls, fried egg-topped bánh mì, and slippery bun with lemongrass pork. 2055 Sawtelle Blvd., West L.A. 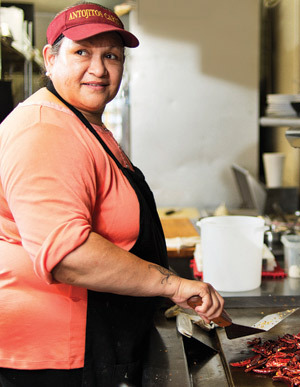 Some chefs are born with barbecue sauce in their blood. 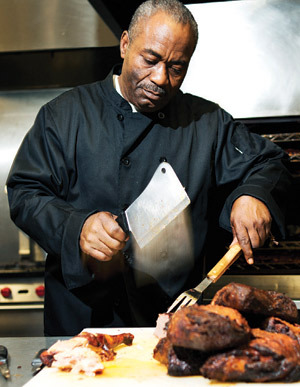 Stephen Randolph, owner of Randolph’s Smokehouse in South L.A., cut his teeth manning some of the meanest pits in Memphis, specializing in hickory-saturated chicken and ribs. Now he serves succulent barbecue, creamy coleslaw, and baked beans out of a small restaurant next door to the shoe repair shop that has been in his family for half a century. 8472 S. Central Ave., South L.A., 323-587-9698. In 1978, Aileen Liu’s family opened Yi Mei, a bustling restaurant in Monterey Park that specialized in hearty Taiwanese breakfast fare. They sold the establishment in 2007 and regrouped to open Huge Tree Pastry up the street, with Liu as head chef. These days mornings are filled with families from the neighborhood feasting on delicate fried crullers, cups of sweet house-made soy milk, and steamed pork buns. 423 N. Atlantic Blvd., Monterey Park, 626-458-8689.